There is something so, so satisfying about the richness of the colours in this arrangement. 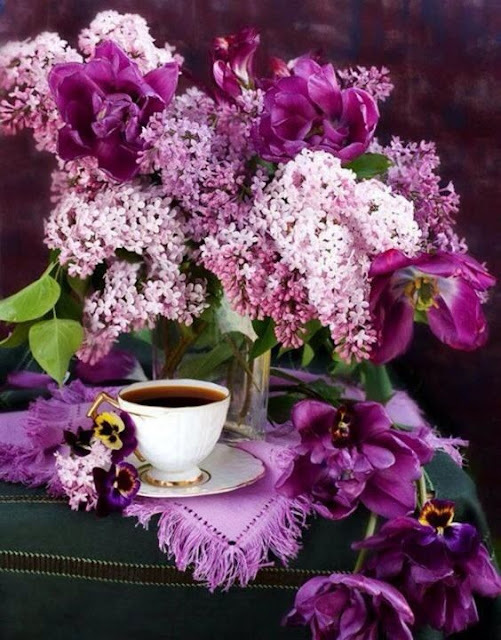 And, of course, I love lilacs and pansies -- they offer such enchanting fragrance in our world. I first spotted this pic on a friend's Facebook page. She found it on Pinterest -- isn't it breath taking? Especially the wild encouragement in the second last line. Yes, let's ... let's f-l-i-n-g it off indeed. I found these and other of his interesting quotes, also on Facebook, when someone shared a link to a post she found here. What a lovely peek into how this brilliant, creative man thought and looked at life. Did you know it would have been his 112th birthday this week? If you want to learn more about this fascinating artist, you'll find a storehouse of treasure at Dr.SeussArt.com. "Nonsense wakes up the brain cells. And it helps develop a sense of humour, which is awfully important in this day and age. Humour has a tremendous place in this sordid world. It’s more than just a matter of laughing. If you can see things out of whack, then you can see how things can be in whack." "Fantasy is a necessary ingredient in living. It’s a way of looking at life through the wrong end of a telescope. Which is what I do, and that enables you to laugh at life’s realities." Earlier today, I had an opportunity to read a most exquisite post by a dear fellow writer, Pamela Mytroen. A beautiful woman inside and outside, Pamela has been a personal inspiration and encouragement to me about my own writing on more than one occasion. Facebook is so much fun when you are 'Friends' with all sorts of creative people who also share your love for all things lovely and beautiful, and who are willing to share their treasures with the world. When I saw this photo from My French Country House, I was instantly reminded of the trip my husband and I took some years ago to Montreal, Quebec, to visit my brother and his wee family -- he was working on his doctorate at McGill University. Their apartment being minuscule we stayed at a wonderful bed and breakfast hotel where they served warm croissants with pots of jam every morning at breakfast. Oh my, my mouth waters at the mere thought. One other thing that comes to mind as I look at this pretty photo is the delight in knowing I have my own now-tidy drawer of lacy doilies and cloths. Yes, they are still a lovely way to pretty up a tea tray or basket filled with something warm from the oven. You will recall that these past two months I've been decluttering, reorganizing, and cleaning in my home. With all my bits o' lace and do-dads freshly laundered, ironed, and at the ready, I'm happily reminded of the simple beauty they add to one's every day life. One. Making cranberry-orange muffins for breakfast. Two. Joining in the Downton Abbey fun. Teapot, pretty teacups and the Lavender Earl Grey Tea are set out in anticipation. Hubby and I started watching Season One earlier in the week, as I didn't think our eyes would take the strain of six seasons in three days. We are glad we don't have to do any nail-biting for we are well acquainted with how the story unfolds, but we're having great fun catching up on our favourite scenes, being reminded of ones we forgot, swooning over the ever-gorgeous parade of clothes, not to mention hearing so many of those now-familiar favourite quotable sayings by our favourite actors. Three. Doing some fun research on our upcoming Trip to England this summer. Flights, accommodations, and tours are booked. Now to dream about how to create a travel journal of this life-long dream come true, and of course, figuring out how to blog about it from across the pond. Four. Chatting with my former piano instructor -- I studied with her back in the 1990's -- I'm taking up the piano again after being away from it for a number of years. It's all a part of the upcoming milestone birthday celebration I'm gearing up for next Spring. It includes the Chopin piece I mentioned in an earlier post -- it's a piece I've dreamed of playing ever since I was 20-something. Will tell more as plans unfold. Five. Meeting friends for lunch on Saturday at a new Italian eatery in town. Looking forward to it. On that note, I'm calling this a wrap. I do hope you enjoy your weekend ... fling off any sadness, dear ones, and watch for glimpses of heaven in unexpected places. Beautiful post,surprised and happy about the piano lessons !! The lilacs are so richly colored and fairly shout of May delights to come. 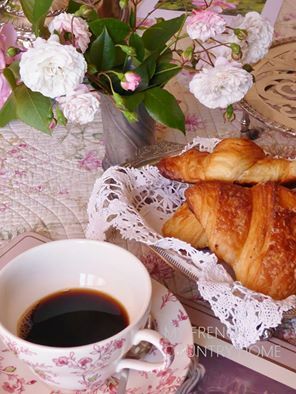 Sharon shows such lovely images on her blog and the croissants look delicious! I imagine your house sparkles these days! Oh Brenda - this post just made my spirits lift. Dr Seuss certainly had a wonderful way of looking at life and so do you too. I have been sipping Chai tea by Twinings - it does taste so much better in a lovely cup. Think it would go very well with those muffins you are making. Oh do enjoy the piano lessons. I played for years every Sunday at our old country Church. Now sad to say the piano has been replaced with more modern musical instruments. Guess that is the way of things but there is nothing more lovely to my ear than a hymn being played on the piano. Well take care friend and have a great week-end. Hugs! Such a beautiful post, the floral arrangement was stunning such a great picture. I too am a great fan of Dr Seuss and love reading some of his silliness to my Grand children. Hope you have a wonderful weekend and that you manage to make some wonderful plans for your visit. Beautiful thoughts and pictures. Yes, the lilacs and pansies picture is gorgeous. I loved the quotes from Dr. Seuss, and they seem so wise to me. He has a way of writing that speaks deeply to the soul, yet brings with it humor , taking away from it any "preachiness'. You have set some mighty goals and I am looking forward to reading about their fruition in the future. Will you be able to post a video of your Chopin performance ? Love that flower arrangement. Great post. Lots of good stuff here. Wonderful...a fine gathering of photos and words and sharing. I do admire your returning to a long-held goal. Some things we let go too easily. Off to follow your link. You DO have a beautiful life and it inspires beautiful posts, which I enjoy immensely. Thank you. A beautiful post. As I was reading it I was thinking that there is joy in going out and seeing the world, there is joy in staying at home for cosy moments. There are other things as well, but there is that joy.